There has been a huge increase in the number of 40-ton timber trucks on Cam High Road, following the acquisition of the Greenfield forest site by the current owners of the Cam Forest. Now up to 10 wagons a day are to be found descending the steep road to Gearstones, which serves as an important route for the Dales Way, the Pennine Way and the Pennine Bridleway. 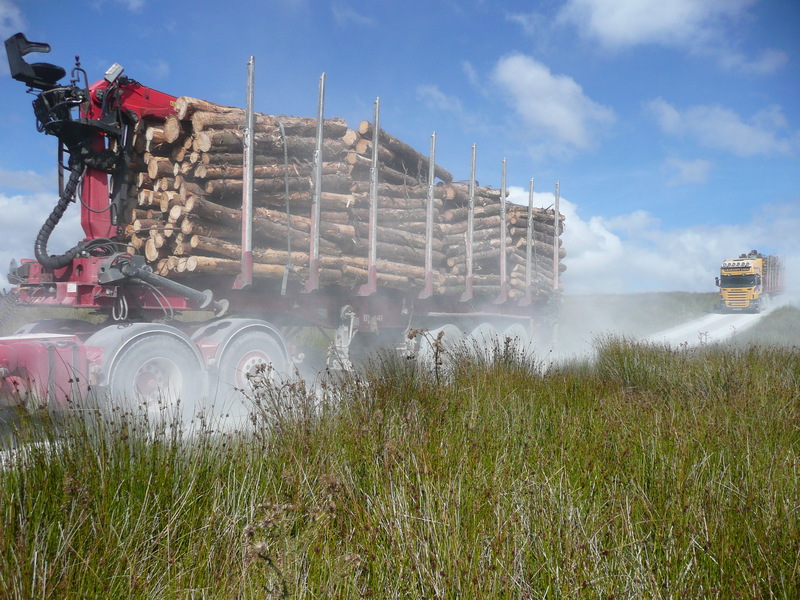 Just last year the owners of Cam Forest gained approval for the limited extraction of timber over an initial period of 3 years, with up to 6 wagons per day. The acquisition of the much larger Greenfield Forest now means the initial period has been extended to 15 years, with the first three years seeing more “intensive harvesting”. However, when DWA members were out on Cam on Tuesday, at least four wagons passed along the Cam Road between 2pm and 3pm. Of course, it is relatively easy for walkers to step off the track and give sufficient berth to the huge wagons, but it is more difficult for horse riders and cyclists, and should any horse drawn cart happen to be heading uphill at the time…. A number of issues remain to be resolved, including the promise that a permissive Dales Way path would be made along the new track at the foot of the Cam Road, avoiding the busy B6255 to Far Gearstones. This entry was posted in Association, Footpath on August 27, 2014 by DWA. 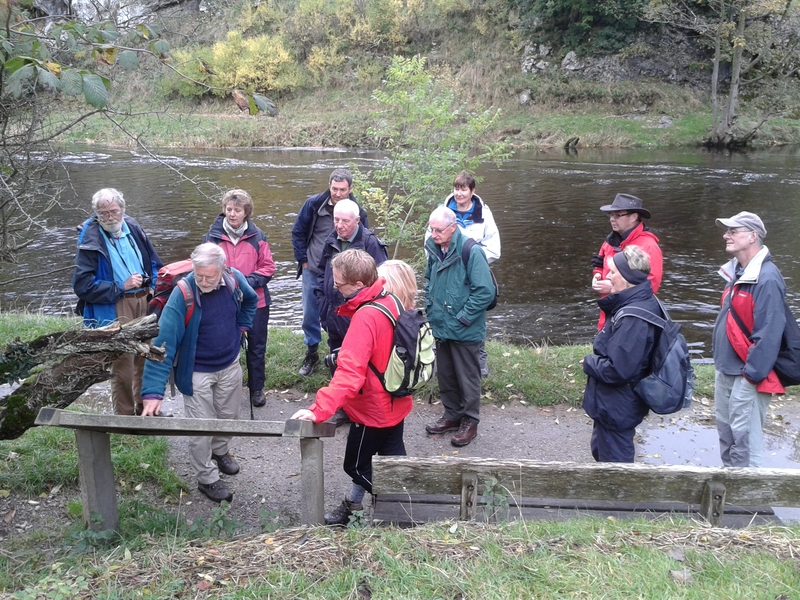 The Dales Way Association held its 21st Annual General Meeting on Saturday 26th October. Despite the awful rain on the Friday and the storms predicted for Sunday, members travelled from as far afield as Essex and Shropshire. The day started with a walk along the Dales Way from Burnsall to Hebden swing bridge where we paused to inspect the work which is being done to replace the planking on the bridge. The repairs have been made possible by a generous donation from DWA member Eileen King in memory of her late partner Roy Doherty and we were delighted that Eileen had made the long journey to join us. We then walked on to Grassington where we had a short break before returning to Ilkley and the business part of the day. We got to Burnsall and returned from Grassington on the number 74 bus, a regular service that takes both locals and visitors up and down Wharfedale and is a lovely ride in its own right. During the meeting Footpath Officer Alex McManus told members that he had spent the summer inspecting the Dales Way footpath and had relied on the bus to travel back to his car. We were astonished to learn therefore that this and other rural bus services are in danger of being cut. See the Dalesbus website here and the proposed cuts here. This entry was posted in Association, Footpath and tagged Burnsall, Dales Way, Grassington, Wharfedale, Yorkshire Dales on October 29, 2013 by DWA. We’re changing the way we organise the news section on the Dales Way website, so welcome to our new dedicated Dales Way News blog! 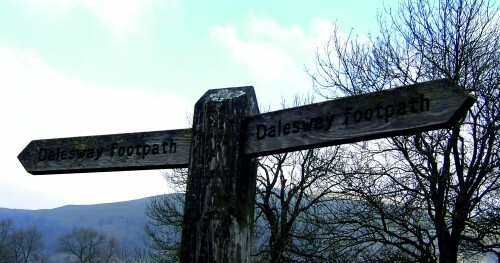 We look forward to keeping you up to date with all the latest news about the Dales Way footpath, events along the route and news of the work of the Dales Way Association. You can find all our older news items here. This entry was posted in Association and tagged Dales Way, National Park, Travel and Tourism, Yorkshire Dale on June 12, 2013 by DWA.